Old Man: Only in numbers do they have courage. You have it while standing alone. 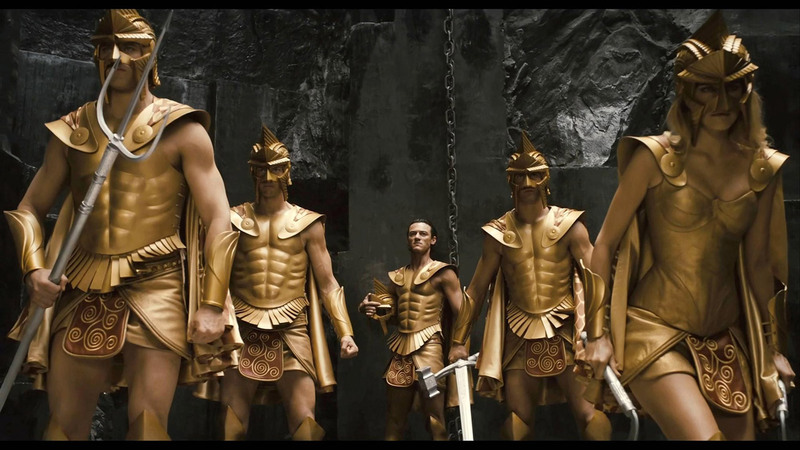 The beauty of director Tarsem Singh’s Greek Myth 3D action film, Immortals, is definitely the most interesting thing about it. At this year’s San Diego Comic Con, Tarsem, known for his work in music videos as well as his two previous films, The Cell and The Fall, made a point of noting that story comes after the fact for him. His focus lies in the visuals and Immortals is a fine example of this in action. 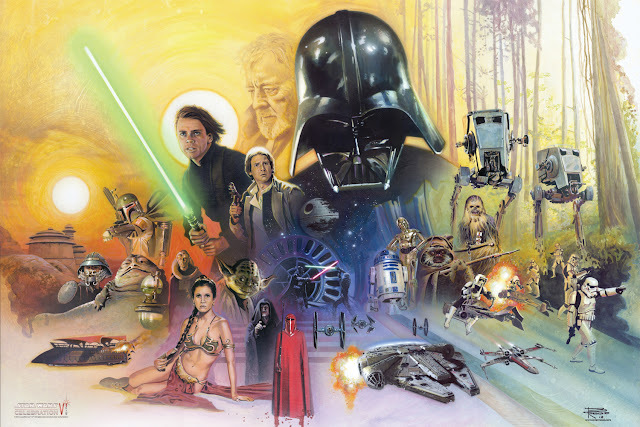 The movie is gorgeous to look at and the audience is certainly given enough opportunities to focus on the visuals, as there is not much to this story, which is treated deadly serious, even though it is just as silly as many of the sword and sandal fantasy films that have come before it. As long as the characters were in the midst of combat I was pleased enough, but the time for talk certainly slowed down the excitement. The film begins with the virgin oracle, Phaedra (Frieda Pinto) having a vision signaling great distress in the world. She envisions King Hyperion (Mickey Rourke) declaring war on the Olympian Gods, with plans to free the imprisoned Titans from Mt. Tarturus. This vision is very much true, as Hyperion is in the process of marching through Greece in search of the Epirus Bow, the only weapon that will grant him the power he needs to carry forth his plans. While Hyperion’s plan is in motion, the Gods are bound by ancient laws to not interfere with humanity until truly drastic measures need to be taken. Enter Henry Cavil (future Man of Steel), who stars as Theseus, the chiseled peasant living in a village carved into the side of one of Ancient Greece’s many giant cliff faces. 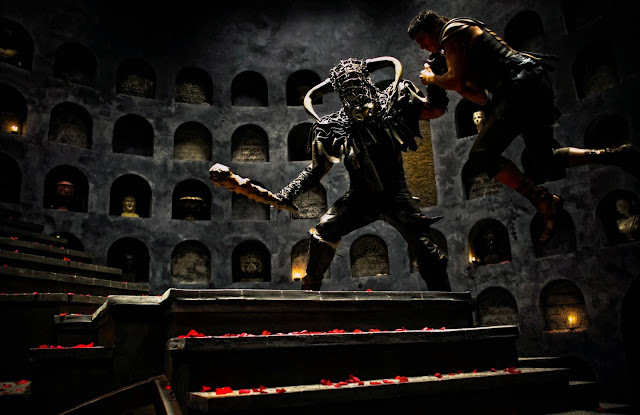 Having been trained by an old man (John Hurt, who is actually Zeus (Luke Evans) in disguise) since childhood to be an efficient warrior and leader, Theseus may be humanity’s only hope. Following the raiding of his village, which leads to the death of Theseus’ mother, he is exiled to the salt mines. Once there, Theseus joins forces with the oracle as well as a master thief (Steven Dorff) in an effort to stop Hyperion. Beyond the intense level of visual satisfaction that this film was dedicated to providing me with, what seemed quite noticeable was the decidedly slow pace of this film. This is fitting with the style of Tarsem, as it allows us to get all we can out of seeing the various production values associated with each scene, but the lack of excitement in between the various kinetic action sequences and intense Mickey Rourke brooding moments gave me too much time to think about what’s not really happening, such as learning anything interesting about the characters or taking time to care about the story. 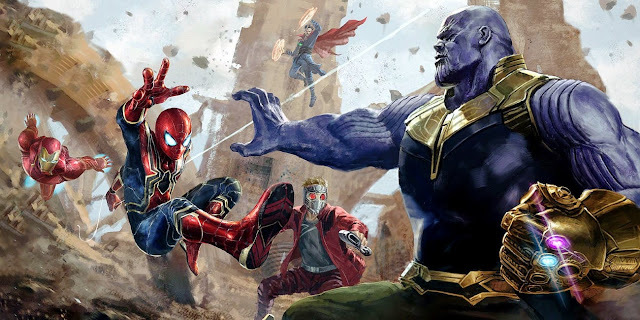 I am all for an over-the-top spectacle and by the time the film arrives at its last act, which is filled with cool bloodletting moments, some of these issues resolve themselves, but getting to that point, I saw a lot of uninteresting down time. There was a forward momentum issue I had with this film as well. 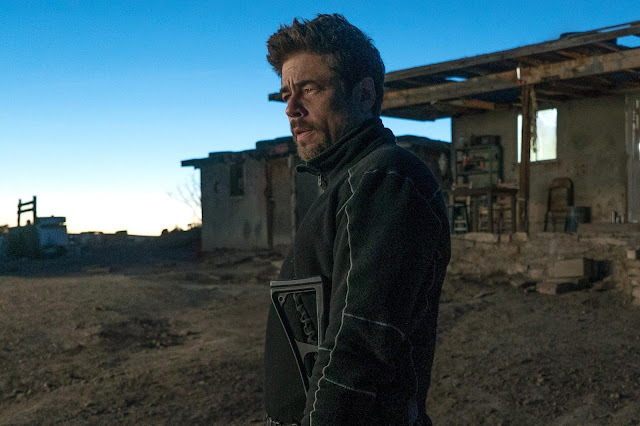 Once again, while it looked fantastic, for being a film that essentially wanted to capture the spirit of an epic, it really felt like I was continually in the same couple of locations again and again. Given that there is so little to the story, it didn’t really help that the characters felt like they were backtracking quite a few times. With that said, I did admire a lot of the ways they incorporated these various locations into the story, such as a labyrinthine temple and the inner sanctum of Mt. Tartarus. 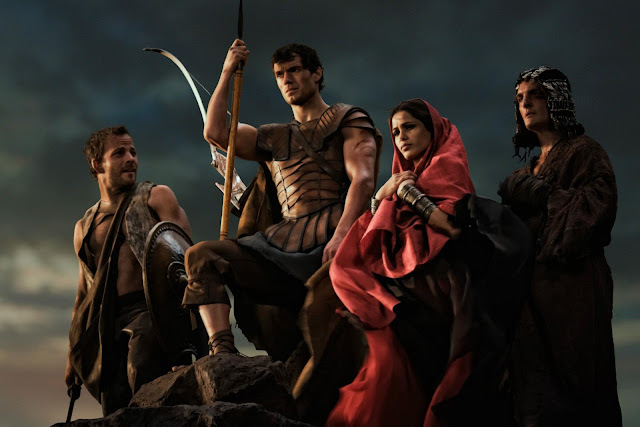 At this point, I will mention that I saw Immortals in 3D and this is one of the better examples of how good a 3D film (that mixes some real 3D footage and a lot of post-converted 3D) can look (despite the many nighttime scenes, making things frustratingly dark at times). Zeus: If there is one human who could lead them against Hyperion, it would be Theseus. An interesting approach I thought this film took was its attempt to both ground the humanity aspects in reality, while also going the complete opposite route by having Gods actually exist in this movie and do very God-like things. This film deconstructs various legends of Theseus, such as his battle with the Minotaur, by having him face off against a large man with a horned helmet; but then goes to the lengths of having Poseidon plummet from Mt. Olympus and create a tidal wave on earth. 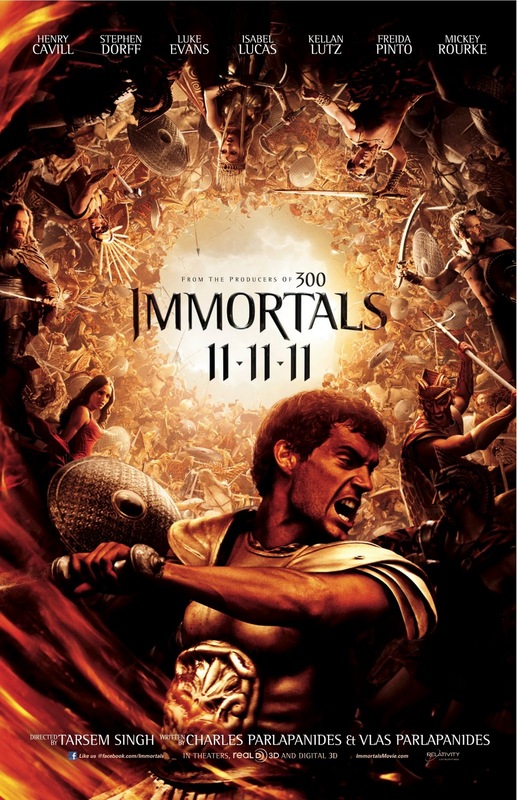 While a film like 300 (the obvious comparison, as the poster for Immortals boasts this is from the same producers) goes gloriously (and fittingly, given that it is being told as a story and not presented as reality) over-the-top and is stylized as hell, Immortals seems to want to achieve a sense of grandeur from its spectacle by having things both ways. 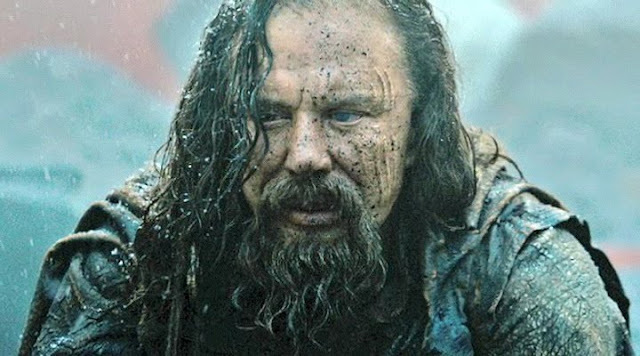 Besides Rourke, there really are no characters in this film worth noting. Cavil does what he can as Theseus, certainly looking good while wielding a sword and shield, but the film doesn’t supply him with what he needs most – compelling words to say when it comes time for the supposedly rousing speech he is required to give to his fellow soldiers. Pinto is certainly a beauty in this film, but she mostly fades into the background, as does Dorff, when he is not adding an aside. Getting to Mickey Rourke, this is the kind of film where Rourke can basically step in and do whatever he wants and it seems totally appropriate. I am more convinced that setting up shots and editing around what he decided to do on his own is what made him so intimidating in this film. While little is done to really expand on who he really is, watching him kill his own men frequently and adorn himself with ridiculous helmets was enough to keep me satisfied with his performance. 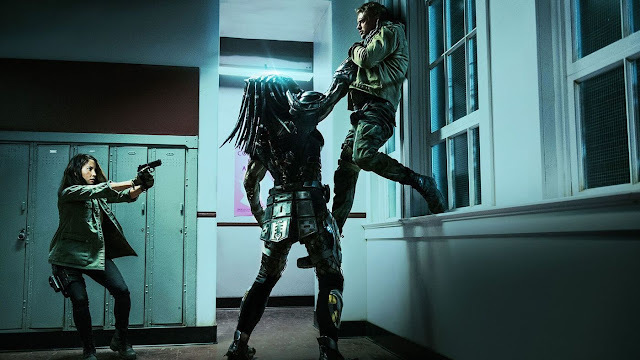 The action in this film is fine. 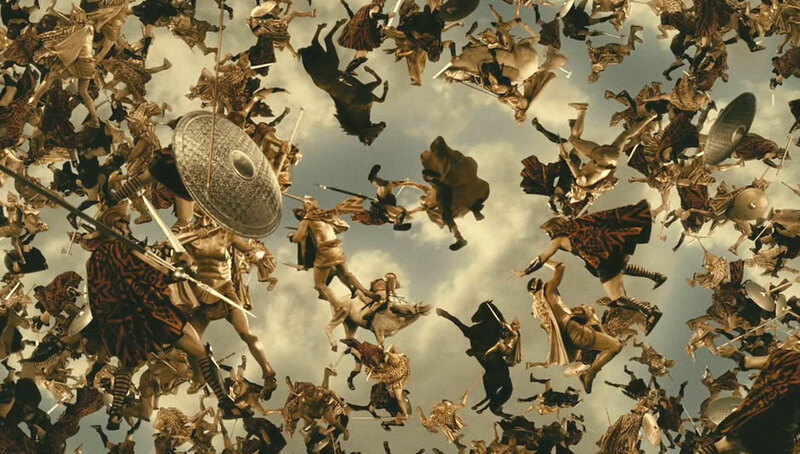 Tarsem constructs a number of good action moments for his characters, even if this film does borrow from many others. I never had a problem following the action, which is the biggest issue of today’s action films. The two most notable scenes revolve around the aforementioned “minotaur” sequence and the final battle, which pits gods against titans. 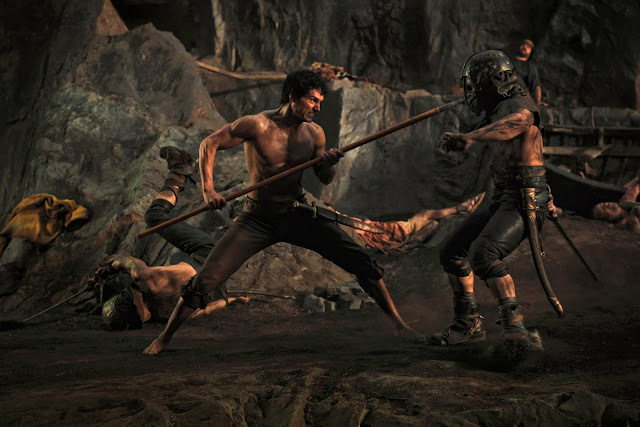 While Immortals has a rough time finding ways to make its dialogue work in between the action, let alone having a sense of humor about…anything, there was plenty of wonderfully filmed action and bloody good body dismemberment to keep those scenes alive and engaging. 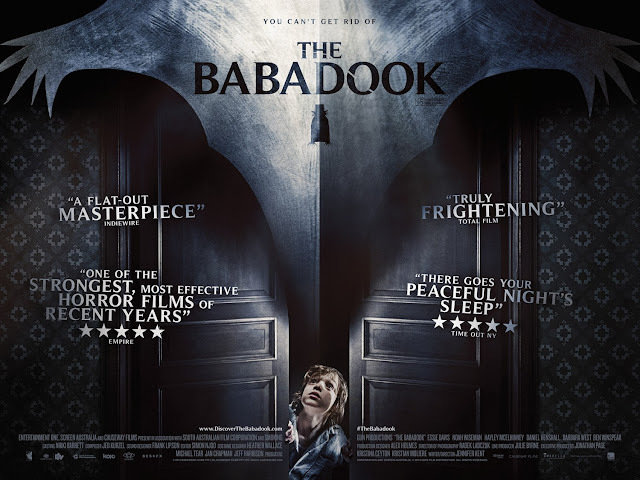 I had higher hopes going into this film, which makes the results a bit disappointing. I did have an overall fun time with this film, but I wish the film had a little more fun with itself. Admiring the beauty of this film is quite easy to do, given how every frame of the film has been digitally manipulated in some way to look fantastic, but I honestly can’t really think of memorable scenes that are going to stick with me down the road. My knowledge of Greek Myth didn’t much help matters either, but that is an easier aspect to let slide. 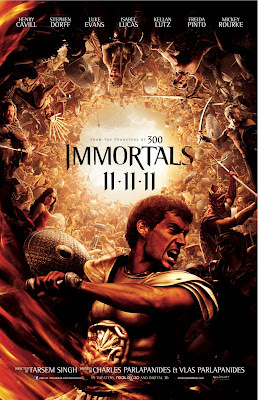 As it stands, Immortals is a silly film that takes itself too seriously; but once it really goes for the jugular the fun gets shot around like the arrows from this film’s magical bow. Zeus: I have faith in you. Prove. Me. Right.